Hebden Royd Red Star sprung a major surprise when inflicting only a second league defeat of the season on Halifax AFL title favourites Stump Cross on Saturday. Goals from James Speechley and Patrick Thomas did the trick against a side whose only previous Premier Division loss had come by 4-2 at home to Ryburn on December 6. Ryburn will be one of the teams encouraged by Stump’s defeat and they stayed in the hunt for honours with an expected win, by 3-0, away to bottom side Elland United. Carl Maguire. Macauley Peacock and Joe Swallow got the goals which inflicted an 11th straight league defeat on United. Calder ‘76 made further progress away from the foot of the table with an eye-catching 5-1 success away to Warley Rangers. Damian Nichol, a dangerous runner from midfielder for Warley, equalised with a superb left-foot volley but Allen restored Calder’s lead before half time after Fairburn’s shot had been saved. Calder’s third goal - a Ricky Topham penalty on 55 minutes after Gibson had been tripped - virtually killed the contest. Calder, who played some nice one-touch football, powered clear through Fairburn’s fine free kick and Allen’s second near the end. Sowerby United kept their survival hopes alive with a 4-3 home win over Copley United in a pulsating game. That cut the gap between the second and third-from-bottom sides to two points and each have six games left. Sowerby were soon in front when man of the match Luke Bridges threaded the ball through to Lee Barber and the big striker turned superbly to lob the Copley keeper from 30 yards. Copley soon drew level when a Shane Dawson effort took a wicked deflection to wrong foot the Sowerby keeper. Minutes later Copley were in front when a Chris Baker shot was tipped onto the bar by Matt Bridges, only to rebound off his back and into the net. The Luke Bridges-Lee Barber combination drew Sowerby level when Bridges pulled the ball back for Barber to rifle home. A clumsy challenge brought Copley a penalty and Gary Ash made no mistake from the spot. Again Sowerby drew level when Barber’s clever pass to Niall Porter was finished with a thundering strike in only the 23rd minute. Play swung from end to end for the remainder of the game with Sowerby looking the most likely winners. They wrapped up the points when Andrew Wadsworth’s long ball sent Ben Attle clear and he kept his cool to slot the winner with two minutes left. Holmfield have shot nine points clear in Division One after making light of a tricky-looking trip to AFC Crossleys, winning 7-1. Martin and Chris Woodhouse scored a hat-trick apiece and Paul Drake got the visitors’ other goal, Craig Gladwin replying. Second-placed Mixenden’s game at Sowerby Bridge was postponed. 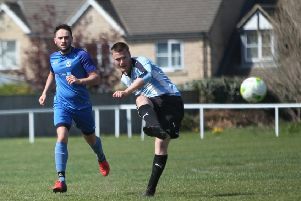 Salem’s hopes of finishing third suffered a blow with a 4-0 home defeat at the hands of Denholme United, Luke Dickinson scoring twice for a United side playing catch up with their fixtures. Greetland Reserves’ chances of escaping the bottom two were extinguished when they lost 2-0 at home to Stainland United. Stainland have been in free fall and needed the points after defeat to next-to-bottom Halifax Irish Centre the previous week. Goals from Dan Hodgson and Craig Peters did the trick. Irish picked up a ninth point of the season in a 2-2 draw away to Calder ‘76 Reserves. Niall Cuttle and Craig Eastwood scored for an experienced visiting side and a draw was a fair result with Matt McCambridge and Gav Martin netting for Calder. St Columbas and Hebden Royd Red Star Reserves drew 4-4 in Division Two and both were left disappointed. Saints were dropping their first points at home this season and blew a 3-0 lead while Red Star had their noses in front until conceding a late equaliser. It looked plain sailing for Columbas when Vinny O’Shea twice applied first-time finishes in the box, before turning provider for Kiutubo Touray to fire in the goal of the game from the corner of the penalty area. However, Saints lost their way after the break and failed to deal with some good balls into the penalty area, Star taking a 4-3 lead. The home side salvaged a draw in the last five minutes when O’Shea lobbed the Star ‘keeper to complete his hat-trick. Top two Brighouse Sports and Illingworth St Mary’s registered emphatic home wins. Brighouse gave their goal difference the bigger boost with a 7-0 home win over Denholme Reserves. Saints will not be too concerned about that, having not yet dropped a point. They saw off visitors Sowerby Bridge Reserves 4-0 thanks to Jake Griffin, Luke Prosser, Lee Cartwright and an own goal. Two goals from Andrew Brunning helped AFC Crossleys reserves win away to their Shelf United counterparts. Honours were even between derby rivals Shelf FC and Northowram Reserves. Adam Dennison scored twice for Shelf and Paul Glew twice for the Rams.